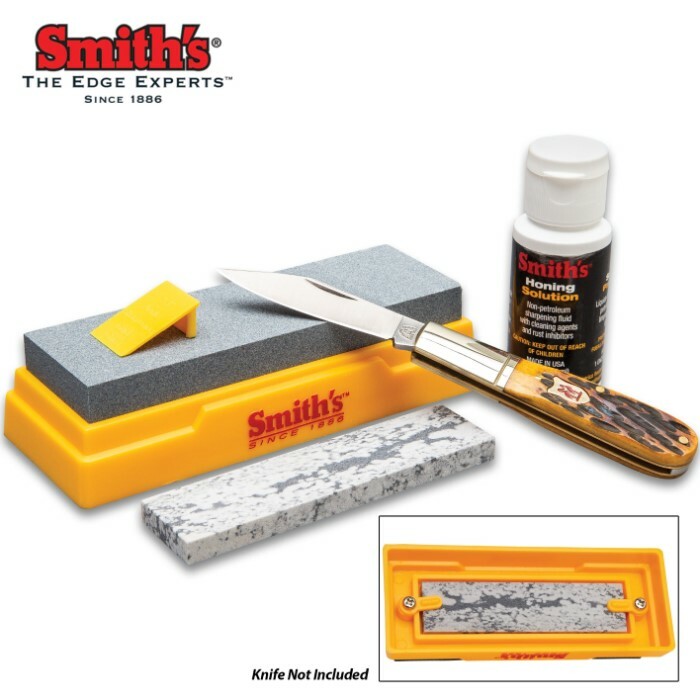 Smith's two stone sharpening kit includes a 5" medium stone used to set the edge on your knife or tool, and a 4" Fine Arkansas stone used to put the final polished edge on your knife or tool. The medium stone comes mounted on a sturdy molded plastic base that features a built-in stone storage area in the bottom for the Fine Arkansas stone. A bottle of premium honing solution and a sharpening angle guide are also included. Kriegar Extra Wide Double Sided Hanging Strop - Smooth Buffalo Leather, Coarse Suede - Swivel Hook - Yields Sharpest Blade Edges Possible - Great for Pocket Knives, Straight Razors & More - 3" x 21"
Great for people new to using stones to sharpen knives. I will definitely recomend to those interested in begining to use stones. And does but a great edge on my knives. I bought this with the tactical tanto warrior neck knife to test the sharpening quality of he stone and it worked very well but the Arkansas stone it came with was VERY smooth making sharpening with the flat top hard so I used the edge which sharpened better than the flat top. the guide was useful but can be lost very easily and my main concern was that the Arkansas stone was removed because when I received my package the package containing the sharpening stone was open and everything was loose. Budk has pleased me as this was my first order from them but I wish they or the postal office wouldn't open the package containing the stone which scared me. Like the review above a bit small, BUT I sure like it! It has done the job it is suppose to do and my knives and I are happy. 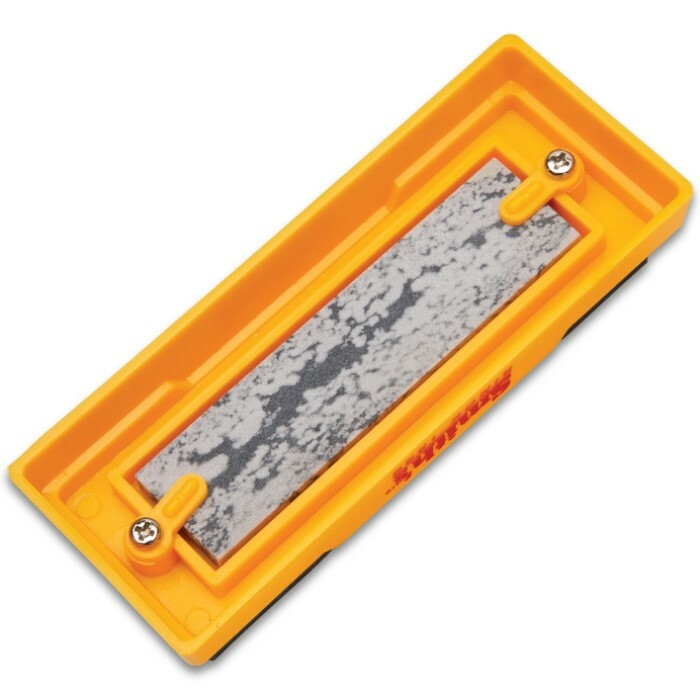 I have owned several sharpening stones, this one ranks up there pretty high. The arkansas stone is really good for a fine edge. Pretty good combination for the price. very good sharpening stone it was smaller than I expected but still very good. 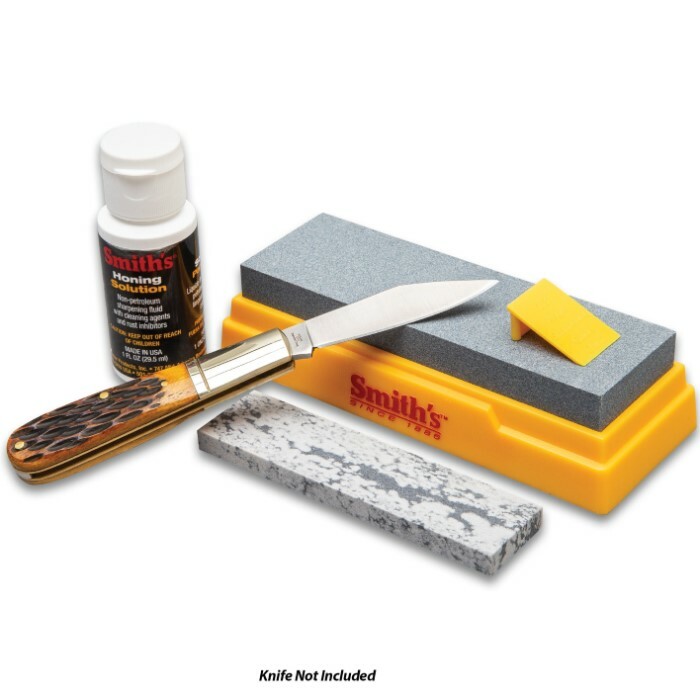 Nice knife sharpening kit. Only use for small pocket knives.